The combination of shell, sand and mud is tough to beat when it’s in the form of a reef. Reefs attract baitfish, and baitfish attracts game fish like redfish and speckled trout. You can thank your lucky stars that we have a seemingly endless supply of reefs along the Texas Gulf coast. Some are big, others are no larger than the average center console boat. However, size really doesn’t make a big difference when you’re talking reefs. Sometimes even the smallest humps of shell can produce big time fishing results. A number of years back I was fishing with Capt. Jerry Norris on Sabine Lake. We left the boat ramp at about daylight and headed up the lake to Blue Buck Point. He eased the big Parker center console into a shallow gut and slipped the anchored into the dark green water. What happened was a blow up on just about every cast. The water on top of the reef was about two feet deep. On the down current side it was about four to five feet deep. When the shad and mullet washed down off the shell and into the drop on the lower end it was game on. Out of about 55 years of fishing along the Texas coast that’s the single best day I’ve ever had while fishing shell. Hell, it’s the best day of trout fishing I can remember. At that time the big reef on the lower end of Sabine Lake was a notorious winter and spring fishing hotspot. 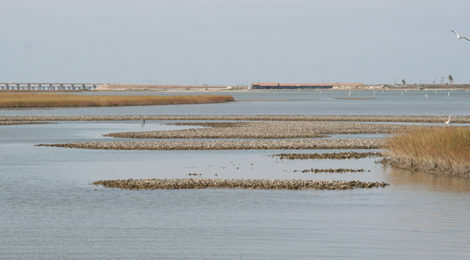 It was one gigantic oyster reef, covering several hundred yards that attracted huge numbers of reds and trout.